The importance of the role of bees in pollination cannot be over-emphasised. It is the hairy bodies of honey bees which make them “master pollinators”, as grains of pollen easily stick to them as they move from flower to flower gathering nectar. 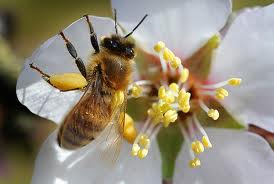 Honey bees also habitually move from one flower to another of the same kind, i.e. pear to pear; which maximises the chances of pollen from one plant being deposited on the receptive stigma of another, thus leading to the production of seeds and fruit. A colony of bees are known to pollinate plants within a two mile radius of their hive. Encouraging wild flowers and minimising the use of some pesticides are two ways of ensuring the continued survival and wide distribution of bee colonies, which is vital for the future of fruit and food production in general.